How to make THAREED ? ثبت في الصحيحين عنه ـ صلى الله عليه وسلم ـ أنه قال‏:‏ ‏(‏فضل عائشة على النساء كفضل الثريد على سائر الطعام‏)‏‏. وروى أبو داود في سننه‏:‏ من حديث ابن عباس رضي الله عنهما، قال‏:‏ كان أحب الطعام إلى رسول الله ـ صلى الله عليه وسلم ـ الثريد من الخبز، والثريد من الحيس‏. In the Sahi'hain it is narrated that Messenger of Allah Sallallaho Alaihe Wasallam said "The Virtue of Aishah (Radi Allaho Anha) as compared to other women, is like the virtue of Thareed as compared to the rest of foods". Abu Dawood narrated from Ibn Abbas Radi Allaho Anh that he said ""Foods that were most liked & loved by Prophet Muhammad Sallallaho Alaihe Wasallam were Thareed made with bread & Thareed of HAIS (dates blended with Saweeq which is Barley's Sattu)". 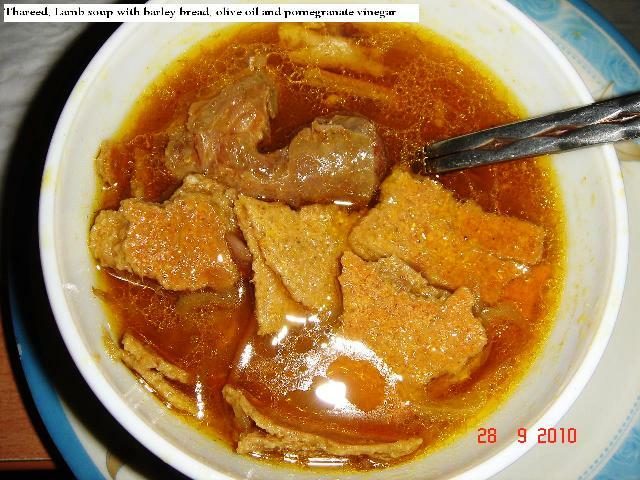 Thareed is made with meat soup & bread. And among all the breads, the best is barley bread. I have seen that some people make Thareed with their meat curry, but the wisdom of THAREED is that it should be easy to digest & it should be wet, so that the bread absorbs the soup & it is softened before eating. So instead of meat curry, a soup is preferred for Thareed. With half kg of mutton, some onions, a tomato, ginger, garlic & spices (as per your taste), add 3 liters of water & put all the ingredients together in a pressure cooker, soup will be ready after 30 minutes. Make small pieces of barley bread in a bowl & pour the hot / boiling soup over it, with some olive oil & pure vinegar. Cover the bowl with a lid for 3 ~ 5 minutes before eating, so that the bread absorbs the soup properly. This is the simplest method of making Thareed. It will be enough for the entire family Insha'Allah.